There's so much you can do while vacationing at Somerset Olympia Serviced Residences in Makati. 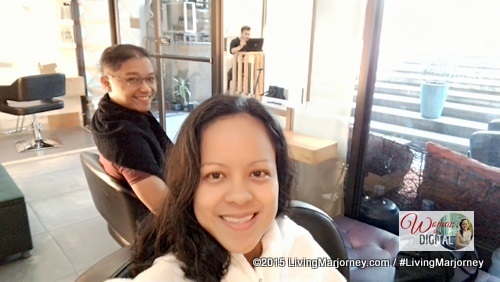 For 24 hours, we never thought we could squeeze in body massage, swimming and lounging at the pool, leisure walking along Ayala Triangle Park, getting an organic hair treatment and eating again and again at Old Swiss Inn. We did not let the afternoon passed by not lounging at the pool, one of our favorite activities when staying in a hotel. We also dine at probably one of the oldest restaurant in Makati, the Old Swiss Inn. 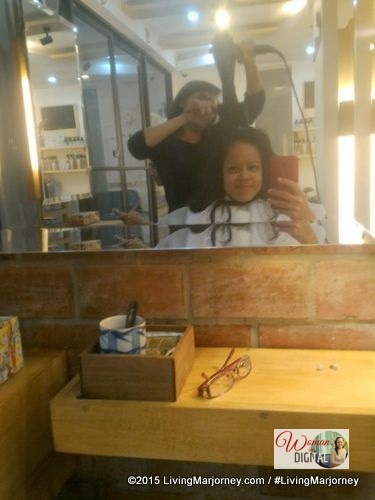 I will tell you more about these things but today I would like to share our hair pampering courtesy of Creations by Lourd Ramos Salon located at Somerset Olympia. We booked our beauty pampering session at 4pm, Saturday. We were lucky there was only one customer so we did not have to wait too long. The friendly staff immediately offered something to drink, I had coffee in the late afternoon. 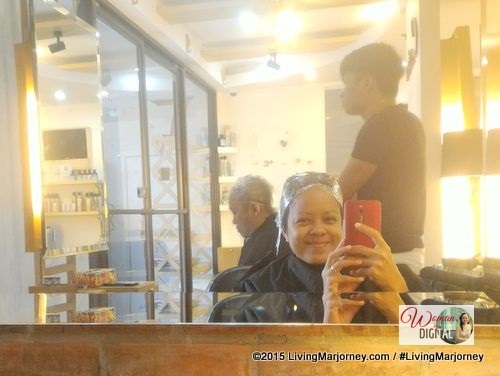 It was our first time at Creations Salon. Unfortunately, we did not met the owner and most sought-after, Lourd Ramos who was in New York then for a wedding. But we were taken cared by Mitch, Radam, and the staff of Creations. Hubby and I availed the Organic Scalp Treatment. Basically, it's a type of scalp treatment that uses two treatments, one for the scalp and the other for the hair strands. Mitch emphasized applying two types of treatment creams unlike others which uses only one treatment for hair and scalp. The treatment helps prevent dandruff and gives shine and bounce to dry, coarse hair. Customers can have it done once a month or more depending on the type of hair. 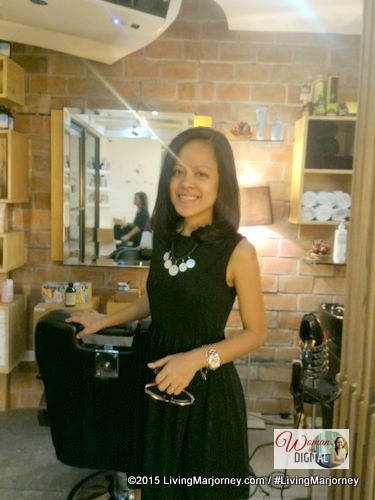 The procedure lasted about an hour depending on the hair length. It was very timely since I really wanted to get a hair treatment and hair cut. If only my hair could speak, they would probably shout for a well-deserved treatment. Unfortunately, the salon I frequent was full last week so imagine my delight to have it done at Creations. The first thing she did was shampoo and put conditioner to my hair, rinsed and towel dry. 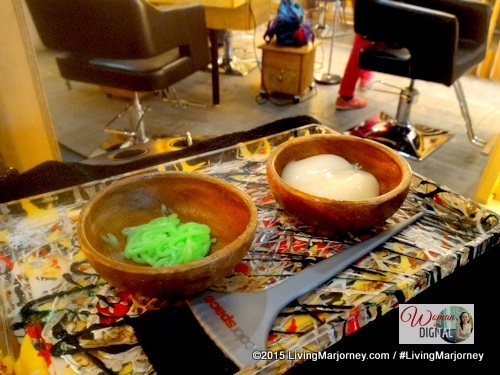 She applied the treatment cream on my hair strands first, then the green one on my scalp. Afterwards, my hair was covered with cling wrap to seal in moisture and let the hair absorbed the treatment. After 15-30 minutes, Mitch rinsed my hair and towel dry. She also used the hair blower to set my hair. I like the smell of the organic scalp treatment creams. The green one has mint thus the cool and minty feeling when applied. I love the scents, both were not irritating even to my eyes. You should not wash your hair for at least 12 hours. 1. You must inform the salon of any kind of allergy - medication, food, etc. 3. The procedure lasts about 30 minutes to an hour, depending on the length of your hair. 4. Scalp treatment does not make your hair straighter. This is how we look after the Organic Scalp Treatment. It's been a week since I had my scalp treatment and I can still feel my hair soft and smooth. It's manageable too. Thanks Mitch and the rest of the Creations for my new hair cut and scalp treatment. <3 Special thanks to Lourd Ramos and #SomersetOlympia for the weekend pampering treat.